Taipei, Sept. 14 (CNA) The Republic of China armed forces have a full grasp of the situation in the waters surrounding the disputed Diaoyutai Islands in the East China Sea and have various contingency plans in place, military spokesman Luo Shou-he said Friday. 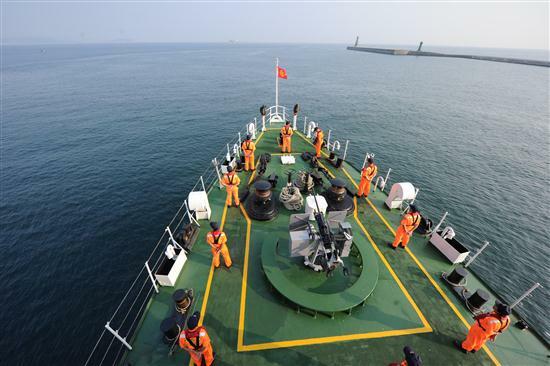 China's official Xinhua news agency reported that two groups of Chinese surveillance ships had already arrived in Diaoyutai waters early that day in a move to assert that country's claim to the island chain. Japan's public broadcaster NHK reported that same day that eight Chinese ships had entered an area near the Diaoyutais -- known as the Senkaku Islands in Japan. Six of the vessels had even entered what NHK described as Japanese territorial waters. With a typhoon approaching the area, however, the media said all six Chinese ships had left the 24-mile zone around the Diaoyutais by Friday evening. Responding to the reports, Luo said the ROC military has been keeping close tabs on the situation and has well-devised contingency measures in place. The government has also conducted an in-depth analysis of the situation in the region and has worked out a series of response guidelines, Luo said. "The military will follow the government's policy and the National Security Council's guidance in dealing with the situation," Luo said, adding that the Navy is maintaining regular patrols in the area. Located some 100 nautical miles northeast of Taiwan, the uninhabited island cluster has been under Japan's administrative control since 1972, but is also claimed by Taiwan and China. The long-simmering territorial spat flared anew after the Japanese government bought three of the Diaoyutai islands from their private owner earlier this week. Taiwan recalled its envoy to Japan to protest the Japanese government's nationalization of the islands. In a move to ease tension with the ROC, Japan's Interchange Association, which represents Japanese interests in Taiwan in the absence of diplomatic ties, issued a statement a day earlier in response to an East China Sea peace initiative proposed by President Ma Ying-jeou. Ma's proposal calls for the claimants to shelve their differences, pursue peace and reciprocity and cooperate in exploring resources in the contested region. Japan thinks it is important to push forward substantive cooperation projects to make the East China Sea a "sea of peace," the statement said. Noting that Taiwan is an important partner of Japan, with close personnel and economic relations, the statement reaffirmed that Japan will not change its policy regarding foreign fishing boats operating within Japan's exclusive economic zone after its announcement of nationalizing the three newly acquired islets. Expressing its hope of reopening bilateral fishery talks as soon as possible, the association called on Taiwan to engage in "constructive" discussions to explore ways of cooperation that are acceptable to both sides. On Friday, Foreign Minister Timothy Yang acknowledged Japan's goodwill in issuing the statement and he urged Japan to uphold its commitment to respect Taiwanese fishermen's legitimate rights to operate in waters near the Diaoyutais. Diplomatic sources said bilateral Taiwan-Japan fishery talks could resume in October at the earliest. The two sides have conducted 16 rounds of talks over fishing rights in the waters surrounding the Diaoyutai Islands without positive results and Taiwanese fishing boats are often harassed by Japanese coast guard vessels near the disputed islands.